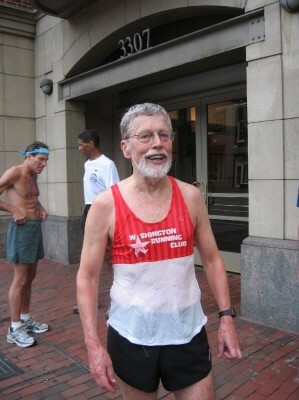 Our man Gerry informed me yesterday he passed the 3,000 mile mark in his running log for 2013, a year in which he observed his 74th birthday. I got out my calculator and learned that’s over eight miles per day, and he routinely takes Saturdays off before the Sunday long run. Gerry Ives, a.k.a. “Ives 3000” is the last real man. I can’t run a lick anymore, and my friend Bennett, 65, tells me it’s because I am old. When I start to rattle off the names of guys in my cohort who run far better than me, his one word explanation is outlier. So everyone my age who runs poorly does so because of age, not because they don’t train hard enough, and everyone who is my age who runs well is an outlier. Gerry Ives is the last real man. While the youngbloods were returning along the C&O canal during last Sunday’s distance run, a fellow harrier cried out “It’s okay, I’ve got you by thirty years!” Gerry was still several miles ahead of both the pack and the prey at this point. This entry was posted in Training by Kit Wells. Bookmark the permalink.